"Our origins were composed of public mortifications in the city of Milan and in the house," one of the first Barnabites, Fr. John Baptist Soresina, remembers. Some Confreres would go through the streets of the city holding a crucifix, to preach about Christ Crucified. Some, standing on a pedestal to be well visible in the midst of crowded places, would speak with great emphasis about the contempt of the world. Some, inflamed with hate for pride and vanity of which they had been guilty, despicably dressed and with a grimace on their face, would walk among the people, aim of mockeries, or would draw insults throwing themselves at the feet of those passing-by. Some, dressed as mendicants, would stand by the doors of a church to beg for alms. Some carrying a huge cross, would walk through the central nave of the Cathedral imploring in a loud voice God's mercy, or would scourge themselves publicly in the church. Some would go to the public market, with a rope on their neck, a basket in their hands, and would offer their service to anyone to transport their groceries. Anthony M. Zaccaria was very much aware of the importance of signs, concentrating his attention on two of them: the crucifix and the Eucharist For the first he came up with the idea of ringing the bells at 3:00 p.m. of every Friday in commemoration of the Passion of the Lord for the Eucharist he promoted the solemn celebration of the Forty Hours with the various churches of the city taking turn. But before his reform channeled itself into these two forms which, up to now, have withstood the trials of time, Anthony Mary had the intuition of the importance of glamorous ges­tures, either to urge true conversion among his followers, or to awaken the lukewarm or sleeping Christian. But the shock caused so massive and dangerous a reaction as to put in danger the very existence of the young Pauline Institute. Fr. John Baptist Gabuzio, the first historian of the Bamabite Congregation, who had re­ceived an eyewitness report by Fr. Soresina, writes, "As he saw his little vessel exposed to grave danger because of the persecutions infuriating against the Congregation, afraid of damage, he imme­diately ran to the rescue doing everything possible to avoid the danger that the healthy practices of his disciples would be diminished or totally abandoned, and the weaker ones would, out of fear, falter from the initial zeal." The vibrant speech Zaccaria gave to the first group of his disciples has the meaningful date of October 4, 1534, feast of St. Francis of Assisi. Anthony Mary first of all reminds them of St. Paul's teaching, patron and guide of his new Institutes. It is true "we are fools for Christ's account!" It is possible to be a follower of Christ only if we accept the foolishness of the Cross. The mystery of the Cross keeps knocking at the door of today's society. The Episcopal Synod on the 25th anniversary of the Vatican Council II (1986) affirms, "We believe that in our modem days difficulties, God wishes to teach us in a deep way the value, importance and centrality of the Cross of Jesus Christ." And who has identified himself with the Crucified Lord better than Francis of Assisi, the minstrel of "perfect joy?" 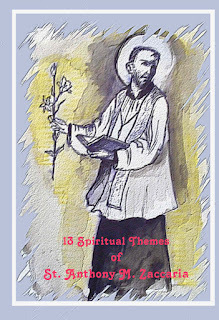 Anthony Mary uses St. Francis as an example to encourage the disoriented disciples. Fr. Soresina writes, "Fearful that some of us may loose the way (on which we had started), he called us in his room and he gave us an exhortation so full of fervor that he inflamed all of us so much that we, full of tears, threw ourselves on the floor promising to persevere. With our hearts full of generosity we promised God to keep walking on the road of contempt. Finally, we were so inflamed that, eliminating any sign of indifference in our hearts, we all promised to spend the rest of our life for the love of our Lord, who for us has died on the Cross. Kneeling we embraced each other, resolving in the midst of abundant tears, to do anything our Father would say, without any reservation. In this way we started to live together in poverty, busing ourselves with the mortifica­tion of the eradication of vices and passions, and gaining our neighbors, not worrying about efforts insofar as it was of benefit to all." A memorable encounter, then, this encounter of October 4, 1534. We like to call it the Chapter of Tears. Those tears were tears meant to melt hearts of stone, and to root them in the love of Christ Crucified, confirming them on a steep road leading to contestation. In that Chapter the Congregation lived out her Baptism, coming out save and affirmed. Since tears are always accompanied by the fire of the Spirit, "We were all inflamed," Fr. Soresina wrote. This chapter of tears, the solemn and dramatic overture of the history of the Zaccarian foundations, can be a most fitting overture for the celebration of the 450th anniversary of the death of our Saint. Five years later he paid with his own life that "not worrying about efforts insofar as it was of benefit to all" If the past has to be open to the future, one thing is for sure: without tears that little plant of the young Congregation could not have survived; the charism of Anthony M. Zaccaria incarnated itself in a history by now multicentennial.